Cali has been home with us for just over 5 weeks. We couldn't be more in love with this beautiful girl of ours! Jeremy and I continue to be amazed at how smooth her transition has been. Part of this perhaps lies in the fact that we are getting to be pros at this adoption thing and have figured out a lot of things that help. But I believe most of it lies in the fact that Cali is a courageous and beautiful soul who was prepared for a family. This preparation came in part from the wonderful people who loved and cared for her in the orphanage and in part because of our ability to Skype with her beforehand so that she would feel more comfortable with us. Most importantly of course was that she was prepared by the one who loves her most! I am so grateful that she was taught about Christ before we ever met her and that she knew that because of Him, she would never be alone. Last Sunday, Cali began taking the missionary discussions to learn more about the gospel. The sweet Elder who taught her speaks Mandarin. Cali and Graci sat through the whole lesson smiling and often giggling. At the end, the Elder asked if she would pray. Cali is extremely shy around people she doesn't know, so she declined and Graci prayed instead (all in Chinese). The spirit that filled our home was tremendous and was such a strong witness that Jesus is the Christ and that He loves Cali more than we can understand. As the Elders left, they challenged her to read the scriptures. Now each night we hear Graci and Cali in their room together reading out loud together in their sweet little voices. I love it! Cali has also begun to pray when others are around. She had learned to say recited prayers, but is learning more about being able to open her heart to her Heavenly Father and just talk to Him. Jeremy said that the other night as he listened to her pray that she asked Heavenly Father to bless her mama's finger to get better. Aw... I love that girl! Many people have asked how the language acquisition is going. Professionals will often tell you that it usually takes approximately one month for every year old the child is to become conversational in another language. For example, Xander was adopted at age four, so it would take him four months to have pretty fluent conversations. We have found in our family that this pretty much holds true. Graci was nine at the time she was adopted, and nine months is right about where she could hold her own in any conversation. If this holds true, Cali should be pretty fluent in about a year. Luckily, the stages between not knowing English and fluency are not as difficult as you might think. Cali is already understanding a lot. She tries very hard to use English words and once in awhile, even attempts simple but complete sentences on her own. VERY impressive. (: I yearn for the day where I can cuddle her and have a deep and meaningful conversation, but for now we do lots of hugs and smiles and "I love yous" and she is very good at expressing her basic needs. Because there wasn't an immediate opening at our charter school, Cali enrolled in our nearby elementary school. This has actually been a huge blessing. At the charter school, 6th grade is included in the junior high, meaning she would be rotating classes all day. At the school she attends, 6th grade is just a normal class. I think it's good for her to be with the same kids all the time and get to know just one teacher. We weren't sure if Cali would even want to go to school so soon, but when asked, she got a big smile and said, "yes!" She found comfort in the fact that her sweet friend, Kara, who lives just a few houses down and has invited her to play several times, would be attending this school. Kara has been a phenomenal help. We pick her up in the mornings so she can push Cali into class. After school she brings her to our van and I drive them both home. She looks out for her at lunch and recess. ALL of the girls are so, so good to her. Her teacher was thoughtful enough to sit her next to a girl who was also adopted from China. Though she doesn't speak Chinese (she was adopted around the age of two) it is good for Cali to be with someone that she looks like and has something in common with. Her name is Lia. Cali is getting more used to American food. She was quite picky at first and didn't eat much at one sitting, but we have found foods that she definitely likes. Yesterday she had two big enchiladas with rice and fruit salad and told me "thank you!" with a big smile afterward. She also loves bow tie pasta with roasted red peppers and sun dried tomato sauce, ham and potato soup, and anything with alfredo sauce. Of course, she loves when I make fried rice or egg rolls or congee, and I often pick up something from the Chinese restaurant nearby just to surprise her. She is so much fun to spoil because she is so appreciative of anything. (: Oh, and she eats about 5,000 oranges a day, or so it seems! 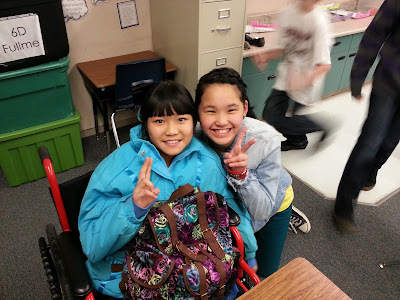 Cali loves to "qq" with her friends from China and listen to Chinese music. She and Graci will often sing along at the top of their lungs-- so cute. I love how well she and Graci get along, but I also love that Cali gets along and plays with EVERYONE. Jesi is particularly enamoured with her, and Cali is patient to play with her and make her feel special. Cali LOVES Parker. They are just one month a part and so cute together. Parker goes out of his way to hang out with her and give her attention, and Cali always loves to go and watch his and Taylor's basketball games. She had the cutest smile on her face as she watched, so we followed by showing her a video of wheelchair basketball. It was sweet to see the wheels turning in her head as she contemplated the things you can do in a wheelchair. Showing my husband your sweet family closed the deal for adoption. He didn't know very many Mormon families who have adopted. He felt the amazing spirit of your family. We are now waiting for our 1-800a. Thank you for the update on Cali! How are things going for the little boy you plan to adopt? What Elder is teaching Cali? Was it Elder Guo? Our little Marilyn was taught by him and we LOVED him! He taught our family in Sept/Oct. as we prepared for Marilyn to be sealed to our family. To make it even sweeter, he was able to attend our family's sealing and translate the ceremony into Mandarin for her. Elder Guo was from mainland China, rather than HK or Taiwan, which I felt was pretty remarkable. When he taught Marilyn he was straight out of the MTC in a area nearby to us. What a tender mercy that God would see fit to call that man to Marilyn's new part of America at EXACTLY the right time when she would be ready to hear discussions. Anyway, I'm sure whatever missionary you have teaching Cali is wonderful, but I wanted to see if it was our beloved Elder Guo. P.S. @ likeschocolate - We are another LDS family who has adopted from China. We have two children adopted from China. Congratulations on your soon to be miracle! Morning guys - thanks for all the insights into Cali - a Blessing again - but somehow I'm not overly surprised by that - the Father gives to us all the time - He loves to provide to His Faithful - and y'all fill that bill! Y'all, you have no idea how much I loved reading this. Thank God for the Greens. Thank God "my" Tang Min is your Cali! Cali, I feel like I know you! I know that I love you! I am so happy you are part of our family! Wow, that video brought tears to my eyes. One of our daughters has limb differences, and I feel like we still have so far to go in accepting others as a nation. It's beautiful to see perceptions being changed. I don't know how many people post on here that you don't know but I'm one of them! :) I know Nikki, your cousin (I think). And she told me about your family blog! This post is beautiful! I especially love that last sentence, "If you've ever considered adoption, consider if more!" You are definitely an inspiration in my life; thank you!